With my hectic May schedule (3 weddings and counting) I thought I better get busy on a Father’s Day Gift, before it creeps up on me. 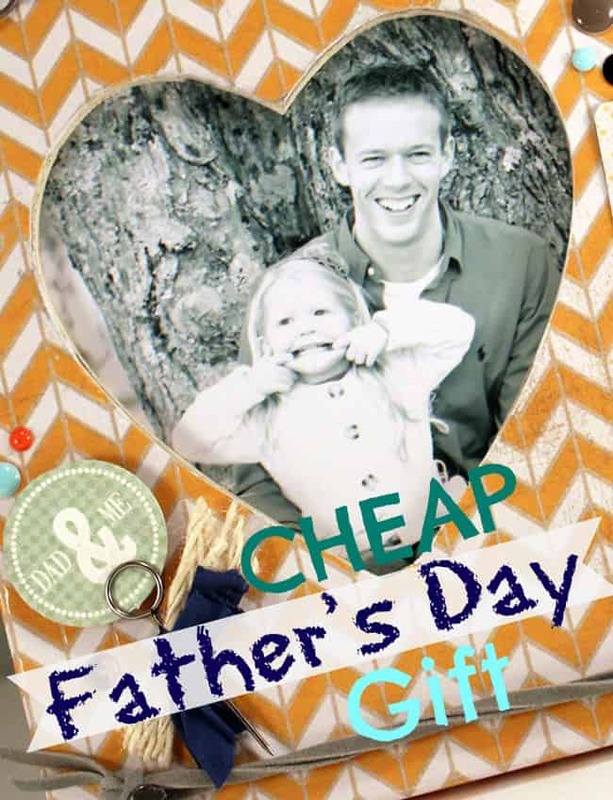 The Scor-Pal was very handy to turn a $1.50 Michaels frame into a sweet Father’s Day Photo Frame. 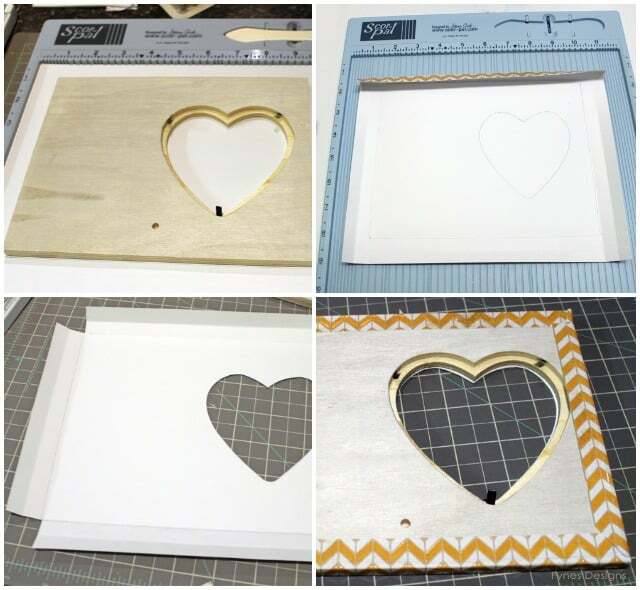 This week May Arts Ribbon and Scor-Pal have teamed up to bring you some ah-mazing projects. I hope you’ll hop along! 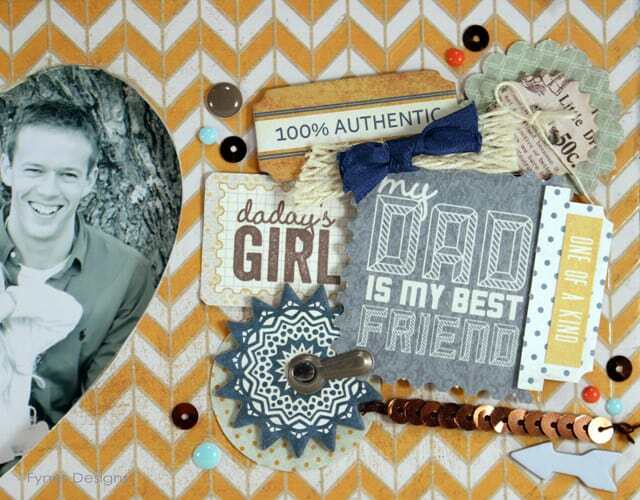 For this project you will need: cheap wood frame, 12 x 12 sheet of pattern paper (DCWV), Fathers Day tags (Authentique), May Arts Ribbon, a Scor-Pal, and a Adhesive (I used Xyron). If you’re not already an owner of a Scor-Pal, be sure to leave a comment to win one, along with your choice of 3 spools of May Arts Ribbon! 1. Lay paper pattern side down and trace around the frame leaving 1″ of paper around each edge. Scor on pencil lines and 1/4″ from the pencil line (stand the frame on the edge to measure for the second line). 2. Cut out hole for the photo, and the square in each corner. 3. I used my Xyron, to apply adhesive. It lets me roll through the entire sheet of paper and gives an even coat of adhesive. Line frame up with scored lines. Fold edges up over sides and adhere paper to the back. 4. 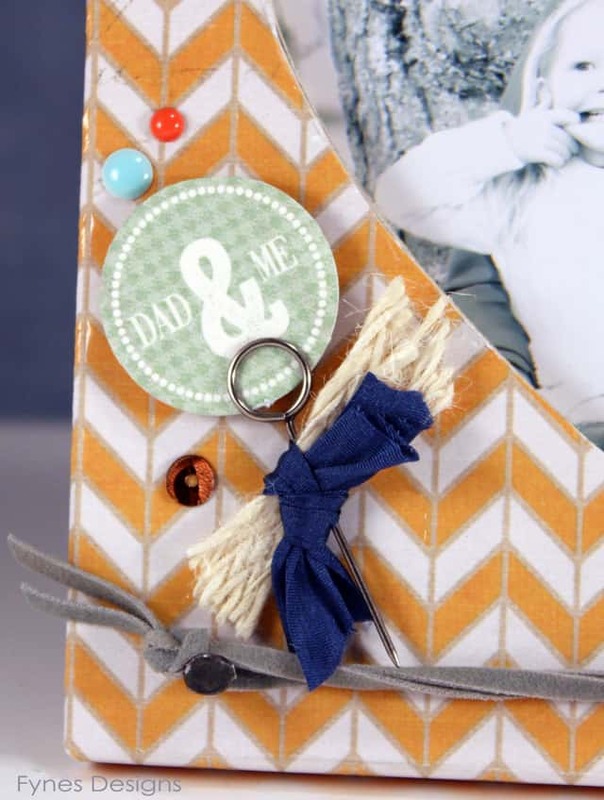 Add a photo of Dad and embellish with May Arts ribbon- I used Burlap, Suede string, Silk, and Sequins. Any Dad would love this Father’s Day Gift, and your pocket book will thank you too, can you believe it was only 1.50!! This is so beautiful…thanks for sharing! Now that’s a Father’s Day gift to treasure. What an awesome Father’s Day gift! Really adorable…..love it…and could be made for any occasion. any father would love this! cute! Great project. Thanks for sharing!! What a fantastic Father’s Day gift for a Dad you love. I just love your design. This is a great Father’s day gift. I love the paper and all the embellishments. 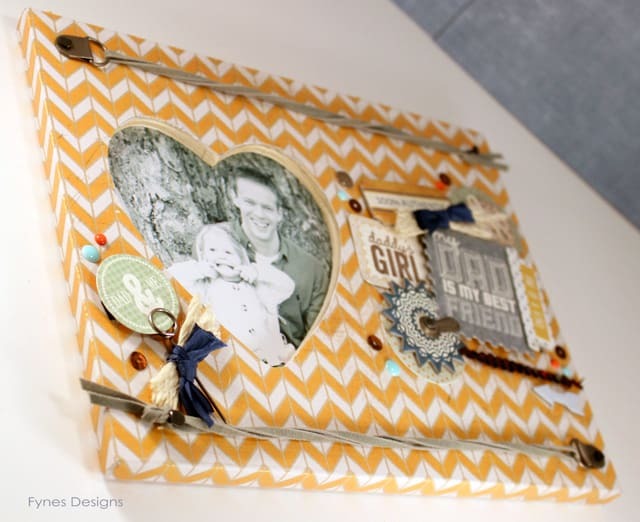 Very pretty frame project! Great idea for Father’s Day! Love it. Hope I can make a reasonable facsimile! Oh my goodness! This is so awesome! What a fabulous idea! Very nice gift! I like cheap wood pieces to dress up! Wow, you’ve totally transformed it!!! Your husband will never know it was a “cheap” frame when he sees how pretty it is now, Great job. thanks for sharing. Gorgeous frame! Great Father’s Day gift!! Your frame turned out perfect! New to your site and very much enjoying creativity. Will have to give this project a try. Super cute Virginia! Love it – and I’m sure he will too!!! Wonderful present and love the embellishments. Great work. Perfect card for many dads in love with their girls! Clever idea!! Never too early to get a head start on the holidays! You really did a spectacular job with this frame. Love the colors. Beautiful Virginia!! Daddy is going to love this for sure, it looks like something you bought at an upscale boutique!! A fabulous frame, such a great gift idea! Fantastic idea! I can see Michael’s running out of frames very shortly…..
Awww, this is so sweet. 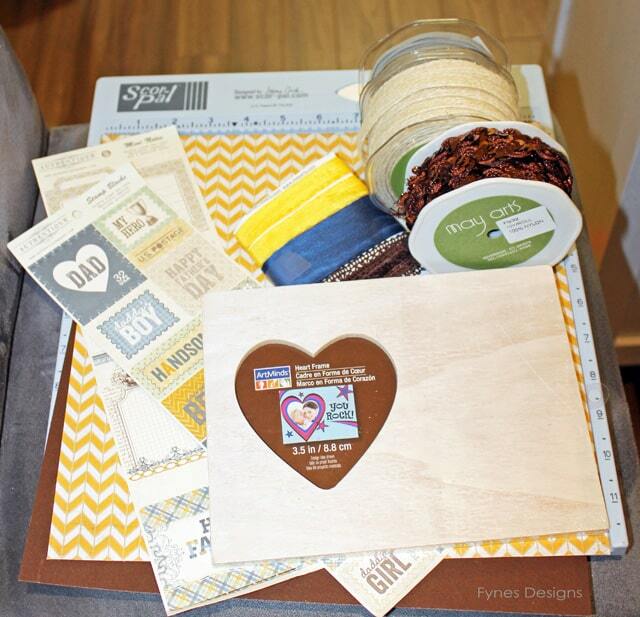 Great inexpensive idea that certainly doesn’t look “cheap.” Looks sentimental and heartfelt. What a Fantastic Father’s Day Gift. I really like the mix of colors and embellishments you used. Any father would love to receive such a gem. Great Gift Idea For Father’s Day! Good Job! Wow! Such lovely work! Thanks for the great inspiration! For $1.50 it is a priceless gift. Great idea..got my creative juices flowing. I can think of all kinds of people to make this for. Christmas here I come!!! Thank you for sharing. Great job!! Love your idea!! Thanks for sharing!! Wow! What a great gift idea. Thanks so much! This is beautiful and such a great gift idea. 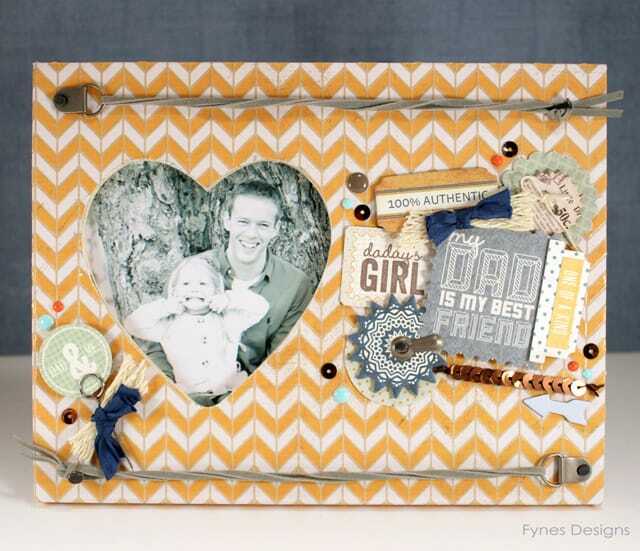 I know any man would love this masculine frame! Thank you for sharing! I think any father would love to get a fathers day gift like this. You could change the theme and crank out a few for wedding gifts too! VERY COOL! Love the embellishments. And the photo made me laugh out loud, reminds me of my youngest! This is really sweet! Not cheap at all! Thanks for sharing! I’ve had those in my cart multiple times, but am always worried about how to cover it and have it not look like my 3 year old did it. Thanks so much for the pictures!! Am excited to try it – pinning right now. Super cute! I love the bright yellow and all the textures. Thanks for linking up this sweet post to the BeBetsy BRAG ABOUT IT Tuesday Link and Hop. Such a cute family you have too. What an adorable frame. I love the picture too. I bet he loves it.